The 18th edition of LFB basketball news is all about Saint Valentine with several clubs offering roses at their matches. Bourges Basket travelled to Nantes-Rezé and just did enough to win (60-55). 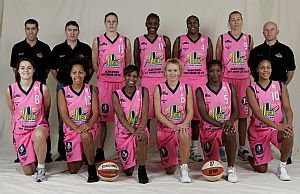 But they remain in second position in the Ligue Féminine de Basketball regular season standings. Tarbes, the current leaders of the LFB, had a difficult game at the home of Villeneuve d'Ascq. They spent most of the game trailing. However the guests took hold of the game when it mattered in the final period to win (63-57). Challes-les-Eaux made things difficult for themselves before overcoming Basket Landes (63-48) to move back into third position. After a first period full of emotion and good basketball, Union Hainaut Basket had the advantage (25-17). The second quarter was a disappointing affair. Chioma Nnamaka scored UHB's only basket 45 seconds from the end of the quarter. Mondeville only scored once during the first seven minutes and ended up winning the quarter (9-2) but went into the locker room trailing (26-27). Sabrina Reghaïssia from UHB started to find the target again for her side to open up a gap of 8 points (42-34). Yet they conceded 6 points before the start of the last period.The final quarter was hectic and the cat and mouse game continued with the guests from Valenciennes leading (49-47). Union Hainaut finally managed to break the sequence and moved 5 points clear (55-50). Clarisse Costaz with 5 points and two free-throws from Lenae Williams brought the teams level for the last time (57-57). With the clock running down Jennifer Digbeu from Mondeville managed to intercept a pass. Unfortunately the shot was rushed and the target missed. Sabrina Palie (right) then managed to draw a foul, which sent her to the free-throw line. She scored both for UHB (59-57). With nothing coming out of Mondeville's last attack, UHB took the victory. For the head coach of Calais, Cyril Sicsic, this win against Reims was an important victory and keeps Calais' play ambitions alive. Olayinka Sanni (left) was practically unstoppable for Calais with her 23 points off 10-of-12 from the field. Lauren Neaves with her double-double of 11 points and 10 rebounds was back to her best. Lina Brazdeïkyte, Calais' captain, finished with 16 points, which included 4-of-8 from beyond the arc. Sara Leemans also scored 16 points and dished out 6 assists. Mariame Dia came off the bench and scored 12 points, while Joysce Cousseins-Smith, another player from the bench, scored 7 points and had 5 assists. Reims who were without Mame-Marie Sy-Diop for this game had the better start to the match as Marie-Laure Fleury-Kindoki found her scoring touch. The lead changed hands only twice in an offensive first period with Reims edging out their hosts in the first period (23-21). Calais started the second period with a 10-0 run as they started to find their mark from beyond the arc (31-23). By the interval the advantage had grown (48-36). Calais continued to fire in three-pointers during the third period and ended the game as a contest by the end of the quarter (79-51). The hosts went on to win (97-71) and shot 10-of-13 from beyond the arc. Bernice Mosby (right) fired in 27 points and 11 rebounds for Arras as they ended their negative series with a road win against Clermont- Ferrand (79-65). Marielle Amant also compiled a double-double with 17 points and 11 rebounds while Jenna O'Hea has recovered her scoring touch with 16 points (3-of-5 from beyond the arc).Leilani Mitchell helped herself to 7 assists. Arras never trailed in this game and took the lead for good at (4-2) and led (24-16) by the end of the first period. Claudia Das Neves, Emma Randall and Elena Nikipolskaia did all they could offensively to keep Clermont-Ferrand on the heal of their guests. Two three-pointers from O'Hea enabled Arras to go into the interval with a 7-point lead (44-37). 10 points from Mosby during the third period helped Arras take control of the game. In addition Emmanuel Coeuret picked up a technical which resulted in 2 additional points for Arras to increase their lead (67-50). With Randall in foul problems, Clermont-Ferrand were restricted in offensive options and were unable to reduce their deficit quickly enough to trouble their guests. For Clermont-Ferrand Das Neves scored 22 points, while Randall and Nikipolskaia scored 16 and 14 points each. Montpellier had to make up a 10-point deficit during the final period. With just over one minute to play Sheana Mosch scored her 25th point of the game to put her side in the lead. A few seconds later Sylvie Gruszczynski went on a run to the basket and was fouled by K. B. Sharp while scoring. She also put in the free-throw, that sent the home fans wild as Montpellier led (67-63) with about 47 seconds to play. Aix-en-Provence's next attack organised by Sharp went according to plan, as the player created the diversion for an opening for Renae Camino who then hit the three-pointer. The clock was running down and with eight seconds left to play Sharp got mixed up with Khadijah Whittington which resulted in a turnover. Camino had to stop Gaëlle Skrela (right) by fouling her in order to stop the game clock. Skrela made both free-throws and then followed this action by getting the ball away from Sharp and prevent Aix from attempting a shot that might have taken the game into overtime (69-66). Skrela was the player of the match with 15 points, 7 steals, 5 assists. She also drew 5 fouls. Gruszczynski also added 10 points. For Aix-en-Provence Hollie Grima scored 24 points and had 9 rebounds. She scored 13 of her points during the first 10 minutes of the game. 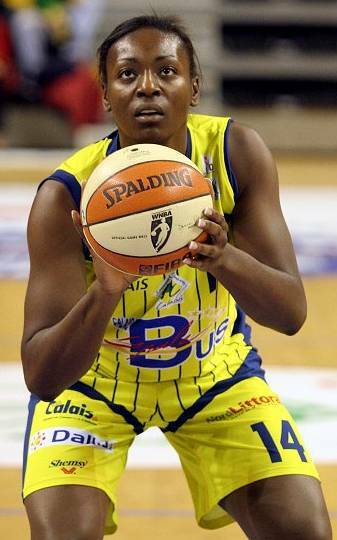 Yacine Séné scored 10 points and also had 5 assists to her name.